A Music Technology blog with multiple contributors. Two weekends ago the MT-Base crew were all in Frankfurt for our annual festival of gear and Weiss Bier. Now I can’t possibly review every bit of the Messe as it’s just too huge, but I’m going to mention here some things that caught my eye and some overall trends. Generally this year seemed more about hardware, a number of large plug in manufacturers that usually have a stand were missing, namely Sonnox and Celemony and companies that do both like SSL and SPL seemed to have scaled down on the computers too. And speaking of SPL, they seem as good a place as any to start talking about specific items. I absolutly loved their passive mastering EQ Passeq. They had it set on a stand working MS next to the plug-in version that held up really well against it’s real life brother. The Passeq was very clear and unaffected, the cuts never felt forced and the unwanted frequencies just slipped away. I don’t think I’m wording it very well, but you know how some EQs seem harsh, like they wrestle the sound into a new shape? Well, that’s not the case with the Passeq. It also looks very attractive and elegant in it’s 4U case. Avid had a stand and were showing their Eleven Rack (Max Woodhams is much better placed to tell you about this than me),the C|24 (we all know what that does) and the Venom synthesizer. I went to the Venom first and I found it to be very awkward to use. The variable controllers and selectors on the left made enough sense, but the rest of it was a bit confusing to work out without a manual. I see now that it has software to make customization easier (there was no computer with it at the Messe), but that, for me, defies the point. It made a good enough sound, ranging from meaty analogue basses to jingly FM style pads. But nothing too interesting. I think it’s trying to do too much with too few controls. Now to a synth I really did love: The Elektrokosmos Kosmonaut. Boy, what a beauty! The Kosmonaut was presented with a transparent sheet layed over the controls that provided labels and divided the rows of knobs into sections. I played for a couple minutes slowly deciding what mods to feed into where and crafting my sound very carefully. However, once the sheet was removed and I was presented with 60 perfectly identical dials in rows of 10 and, even though i had just seen it with the dials, I had no idea what did what. This is like some amazing release of creative freedom! I immediately forgot about crafting my sound and pre-planning it to just manically twisting dials. The sounds I created were much more dynamic and interesting than my earlier attempts. The thing also looks great unlabelled and if you master it you will officially look like a genius! The Kosmonaut is pure analogue circuitry and it sounds great! No price has been announced yet, but you can expect thousands, and it’d be very very worth it. And to round off the synthesis talk I’ll mention the Korg Monotribe. It’s a slightly up-scaled version of the Monotron, which was great for it’s tiny stylophone like shape and playability. The Monotribe is slightly larger and has basically added a couple of features to the monotron, like a step sequencer and some drums sounds. With these features I believed that Korg were trying to push this device from the fun toy and sound maker (Monotron) to a more mature and usable instrument. However it still lacks MIDI in, a feature that should be easy to package in it’s small frame (look at the Nanozwerge for inspiration) and just seems not there to push Korgs higher end products. 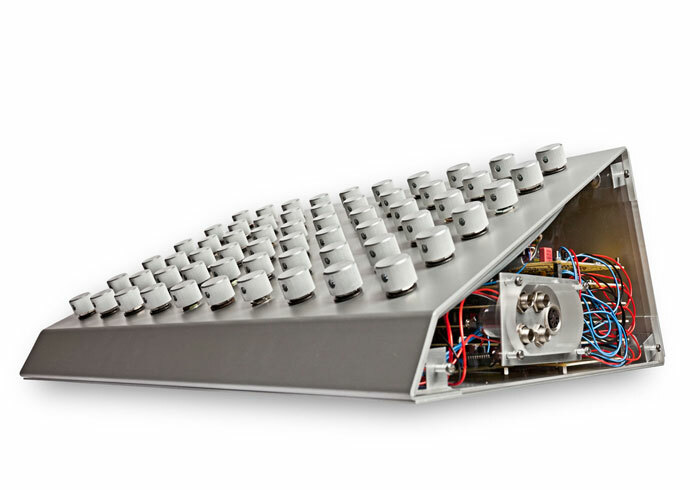 So disappointing from Korg… I’d definitely buy the Nanozwerge if you want an analogue synth under £200. It’s got all the features you’d expect, makes a big analogue sound, is very small and tough and is controllable via MIDI. Non-synth stuff now; I didn’t see much in the way of new microphones this year, however they’re very hard to test in such a noisy environment. It was better when DJs were downstairs with pianos, but now, alas, they’ve been put in the same hall as the music tech gear. The same goes for monitors, however the new Neumann near-field monitors, the KH120, managed to cut through the Prosound hall noise with remarkable clarity. Neumann had set them up for 5.1 monitoring, but the sofa in the middle was chock-a-block, so I had to deal with ambient stereo. However, the fact that they appeared crystal clear in the highs and tight in the lows in such an environment can only be considered a testament to them. But then again, what else would we expect from Neumann?! I love Toft Audio desks, they’re attractive and different with perfect fader weight and usability. They are also very compact, no wasted space on them at all. The 24 and 32 channel models really are the type of desk I’d love in my studio. Quality and feature heavy, but small enough to fit in! I always enjoy listening to the Unitiy Audio’s The Rock monitors., we heard them first as a prototype 3 years ago. Since then they’ve had a slight facelift and been released at the £1800 mark for two. Very good top-end nearfields. They have ribbon tweeters and an enclosed design. Elysia are still pushing their mental compressors with negative ratios. They’re so much fun! I’m not quite sure when I’d want that feature during the recording process though. It’s possible to almost remove the close-mics from a stereo drum stem, which is a fascinating trick and maybe one that you might want to use as an effect. Every year Elysia are growing the plug-in side of their company. The M-pressor plug-ins give the same negative ratio trick as the hardware models, but somehow it’s just less fun. Lastly, I’ll mention the Reaktable, that has always drawn a large crowd to it’s corner of the hall. The table itself hasn’t changed, and as amazing as it it, it’s still not useful in a studio and it’s just priced far to high for most places they say it’ll be good for (schools, colleges, audio therapy units, etc). However the iPad/iPhone app is great. As it can import any wav and save the table so that you can recall patches you’ve made. I would love to see them produce a standard plug-in version for computers and DAWs. I think they might be surprised what it can do as a serious instrument if they did that. Anyway, I’m typed out. There’s things I’ve not mentioned, hundreds of compressors I used and thought “yup, very nice…” to. I hope I’ve given you a taster of what was about in this years Musikmesse.